There’s really no need for the Objective or Summary of Qualifications sections. Your objective is to get the job you applied for. 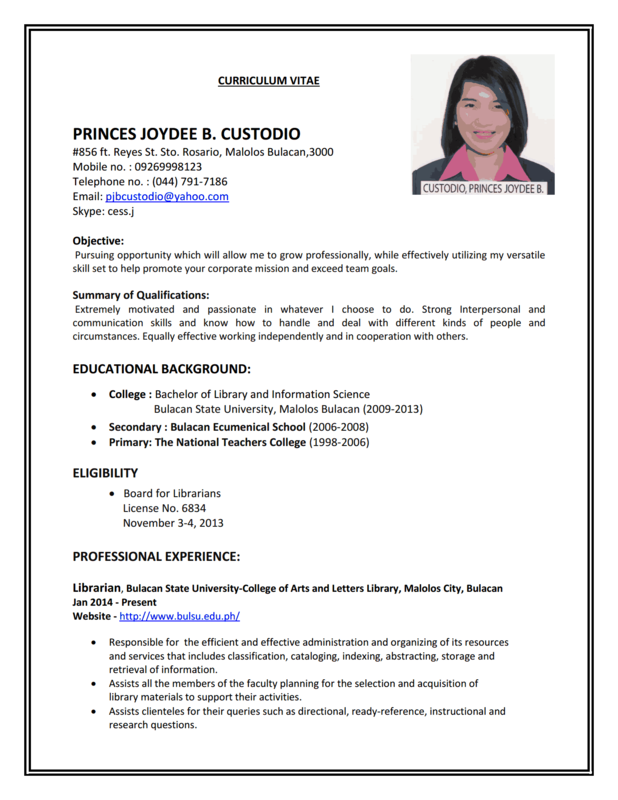 Your summary of qualifications is your cover letter which should be personalized for each job. Can you put the Eligibility information all on one line? It’s taking up an awful lot of space given that the information is only really important if you get the job offer. You might even cut it out and just mention in the cover letter that you’ve got a license with details upon request. I might put the Professional Experience section above the Education. All of the applicants should have similar educational backgrounds, but your professional experience is impressive and unique to you.Or maybe not since the education section is much shorter. Try it the other way and see what you think. I like how you have the Professional Experience section set up and how you describe your activities in each position. Some would say that the activities in past jobs should be phrased in the past tense, but I think you’re fine the way you have them. There are some quirks in the language in those descriptions that make them read a little oddly. You should have a native English speaker give them an edit. I think the formatting of your resume looks great and it’s very well laid out and easy to read. Depending on local practices, you may (or may not) want to remove the objective statement since it really doesn’t add much to your candidacy. If you are going to apply for positions in the US then having a photo on your resume isn’t necessary. I would also recommend trying to condense some of your accomplishments at past positions down to fewer bullet points. A resume closer to 2 pages is usually recommended on career advice sites. 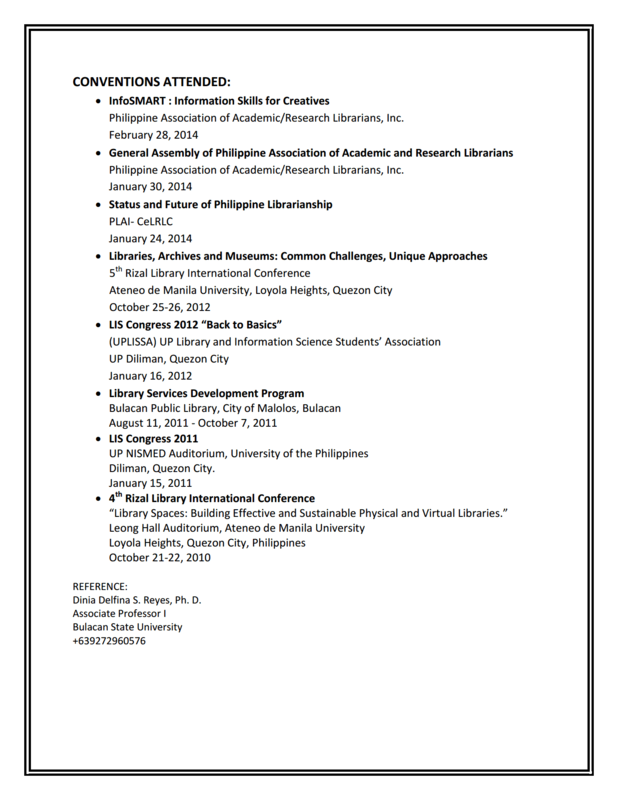 This a very nicely laid out resume–it catches my eye right away! The Objective Statement is so generic that is essentially meaningless. I encourage you to write one that was more focused on each position applied for. It will take longer to write a statement for each application, but in the long-term it will be beneficial. The Summary of Qualifications would also benefit from similar targeting. Both sound like they are boilerplate– find a way to make these more personal. You have done a great job in highlighting your experience – it is very easy to read is very good sense of your qualifications! Photos are generally not needed, unless you are applying for an on-air or acting job. I would not include the URL of your employer unless you designed it. It makes me want to go look at it and not at your CV. Don’t give your reader an opportunity to go away. I know it is good to show you are current and up to date, but a list of conferences attended really doesn’t do much for me. I’d rather see presentations made at these conferences. You might instead list things you implemented as a result of going to a conference. As an employer, I want to see the return on my investment of sending you to a conference. As for references, I like to see 3-5 or “available on request.” Having just one makes me wonder why there is only one person willing to speak on your behalf! 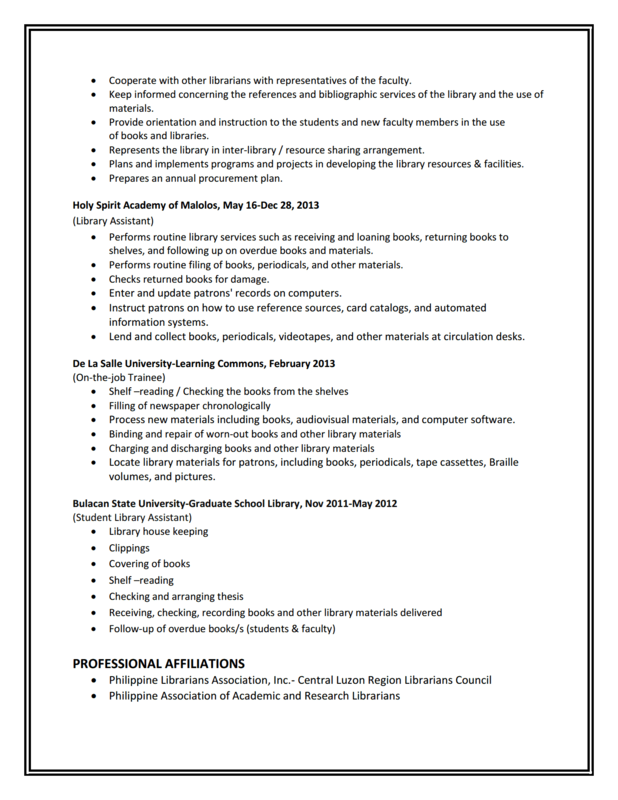 Overall though, you have some great experience and do a super job in presenting what you have to offer any library deserving to hire you! Your resume is very nicely presented but could use a few adjustments. I would not include an objective. They seem to be “outdated” and take up valuable space. Likewise, I would format your eligibility to one line to save room on your resume. Double check that you are formatting your position listings in the same way. On the first position, you list the position title and then the organization. In the following positions, you list the position title under the organization. I personally like it better the first way. Also, why are you putting periods at the end of each bullet? They are not full sentences so the statements do not require a period at the end. I agree to not include the website for your first position. If the interviewer is interested, they can look up the company’s website. I hope this helps. Good Luck with your job search! You’ve done an excellent job of presenting a CV that is visually appealing and easy to read. Even though I’m not a personal fan of objectives, qualification summaries, and photographs, the text is so nicely and evenly spaced that I found myself reading those sections. However, the time I spent on those sections may have been to the detriment of other sections, which I tended to skim over. For example – I agree with others that some of the responsibilities you’ve held in previous positions (namely, Student Library Assistant and On-the-Job Trainee) can be summarized easily into 1 or 2 bullet points or a brief statement of activity. Additionally, in your most recent positions, you might be able to expand on some of your activities. In your current position, you list the preparation of an annual procurement plan; what is that exactly? Is that a component of collection development activities? Is it a library-wide plan, or is it a plan specific to certain departments or subject matters? Perhaps indicate the relative scope of this and other projects and duties – how expansive is X activity, and how is it effective/impactful? Lastly, you may want to consider adding any responsibilities you’ve held as a member of a committee, task-force, executive board, etc., whether on the job/in the library or in a professional organization. Your leadership role(s) will be much more impressive than your role as a general member. I agree that you should remove conference attendance unless you presented at one. Also, I would remove your reference listed on your C.V. and just have the information ready when you are asked for references. I would remove both the summary of qualifications and the objective as they both read as generic statements.